In the face of chickpeas, much-maligned value bacon, burnt pineapple syrup, stilton cravings and a school PTFA cake sale on the final afternoon, we succeeded in feeding ourselves on £1 a day each for 5 days. I can’t say we were ever truly hungry, given the volumes of bread/oats/pasta/rice consumed, but it certainly made us much more conscious of the straightjacket of a minimal budget, the repetitive nature of the meals possible, and the juggling needed to survive. had to cope with limited food: throughout the challenge we were always fortunate enough to have a roof over our heads, the fuel to cook and heat our home, safe water to drink, the money for transport to work and access to education for our children. The most common question we’ve been asked since finishing theLive Below the Line challenge was what we ate to celebrate. A lobster extravaganza? Venison and claret? In fact, the thing I was most looking forward to on Day 6was a banana – accompanied by a cup of my normal tea, with normal milk. My husband treated himself to a pot of real coffee, and revelled in eating some cheese for lunch. After 5 days of subsistence living, and more fried rice than I could shake a stick at, I couldn’t face lavish, rich food. 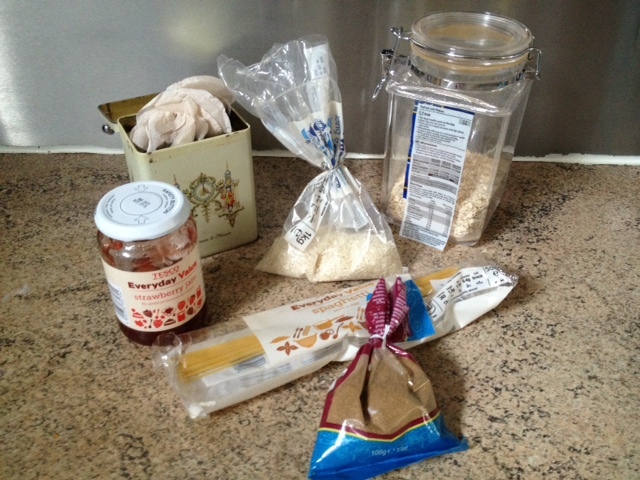 and finished Day 5 with this: 150g oats, 145g rice, 25g dry spaghetti, a bit of jam, loads of tea bags and 85g garam masala, worth about £1 in total. The remaining oats met a worthy end when I transformed them into flapjack, something which the whole family could enjoy. The combination of oats with sugar, syrup and Stork was about as luxurious as I could cope with,and at 7p a piece might even have fitted into a Live Below the Line budget.